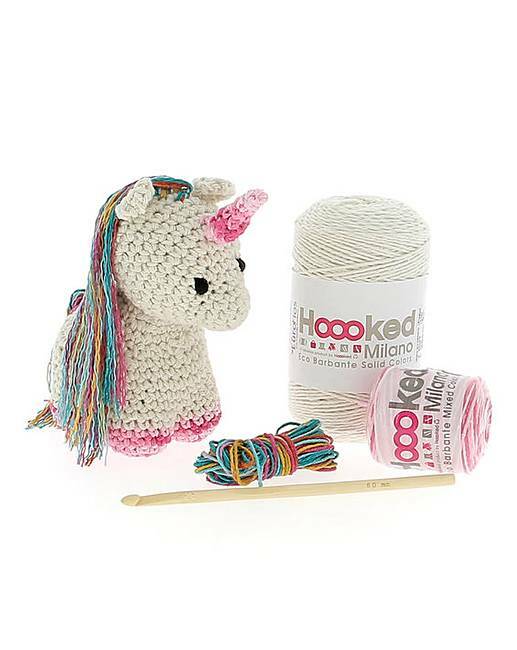 This magical and colourful unicorn named Nora is the newest member of our Hoooked family. The unicorn is crocheted with recycled cotton yarn Eco Barbante and is about 17cm high. This Hoooked crochet pattern guarantees hours of crochet fun and you will end up with a very cute unicorn to give away or to cuddle with! You use the Eco Barbante Almond as base and a colourful 50gr Eco Barbante bobbin for the details. Furthermore, you need some colourful Eco Barbante left-overs for the tail and manes. We advise you to work with a 5-6 mm crochet needle.